I was impressed by some of the Star Wars-themed paper snowflakes I saw here, but naturally I was a little disappointed to see that there was no Jabba the Hutt design. So after trying to cut out a couple of them to get the feel for it, I made my own Jabba design. And I’ll have to say, cutting out the parts that aren’t on a fold (like the eyes) is super hard. You can use scissors on the folds, but for the other parts you need an Xacto knife, and just cutting through all the layers of paper proved really difficult. The cuts aren’t as clean as I would have liked (and I even cleaned them up a bit after unfolding it). 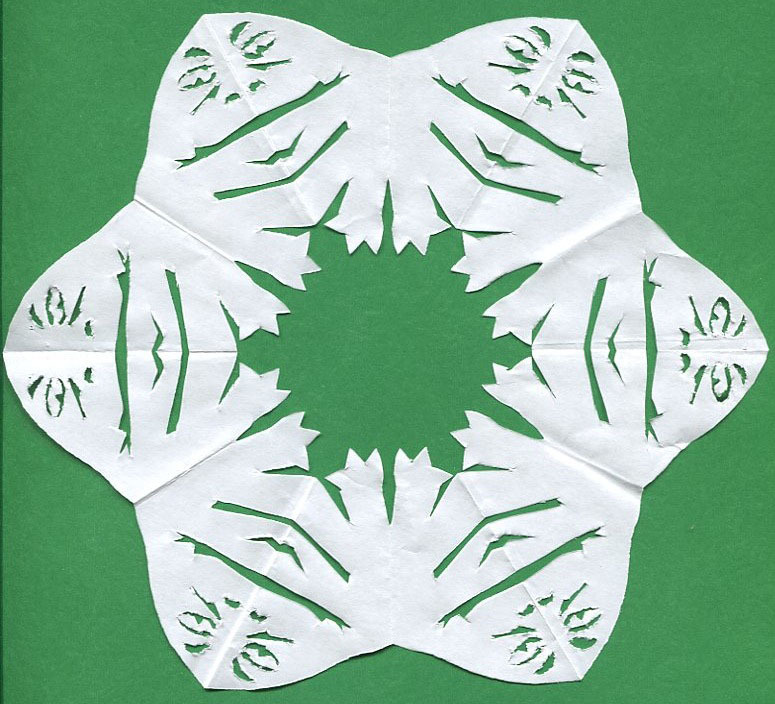 I think maybe using a different kind of paper and maybe a sharper knife would lead to better results, but I can’t imagine trying to cut out some of the more elaborate designs. I had hoped to work in Jabba’s tattoo design into the snowflake, but it ended up being way too intricate to actually pull off.